You may have recently started hearing more about “cupping” or noticed red circle marks on athletes on TV. 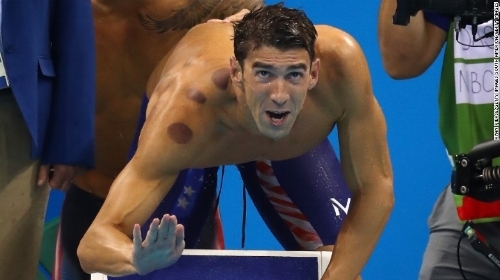 We all remember wondering what those marks were on Michael Phelps during the Olympics. Cupping has been around for centuries but why is it now getting so much hype? Over the last 2 years I have been using cupping/Myofascial Decompression (MFD) on myself and within my practice. I have noticed great benefits and have wanted to continue to learn about the technique. I recently took Cup Therapy’s Level 1 course and was impressed even more. What I learned though is that Myofascial Decompression is different than traditional cupping. Continue reading to find out the differences between MFD and tradition cupping, the benefits, what conditions it works well for and why you still need formal physical therapy. Cupping and MFD use negative pressure forces on suction cups to create lifting of the tissues. This creates space within the tissue layers for improved gliding and mobility. We have many layers to our skin, including fascia, that should move fluidly but due to injury, inflammation, and simply over time the tissues can become thickened and less mobile. Unlike other forms of manual therapy (massage, myofascial release, IASTM, joint mobilizations) that are compressive in nature, cupping and MFD are decompressive. Decompression helps release tight tissues, improve trigger points, improve blood flow and nutrient exchange and create a change to the neuromuscular system which allows for temporary pain relief. What is the difference between MFD and cupping? Traditional cupping has been a part of many Eastern cultures for centuries. You may have heard of or had “fire” or “wet” cupping. These techniques are mostly performed by acupuncturists or massage therapists and used to promote healing through a change in energy systems. This technique is passive in nature. This can be beneficial but it differs from MFD. Myofascial Decompression, or MFD, uses similar tools but adds the art and skill of movement to create physiological changes. It is considered dry cupping, meaning there is no fire or cutting of the skin. With the manual pump you are able to get more pressure generated thus lifting up more on the tissue. Cup placement is based off muscular anatomy. Once the cups are placed, treatment involves ACTIVE movements of the joints followed by neuromuscular re-education to improve movement patterns and make lasting changes to the tissue. What are the benefits of MFD? What conditions can you use MFD for? You can do MFD on most areas of the body. Most commonly it is used on the shoulder, forearm, neck, back, hip, knee, IT Band, calf and foot. The main side effect after cupping is that you are potentially left with a circle bruise or redness. This depends on the area cupped and visability varies in length of time, usually 3-7 days. Cupping can also create a Vasovagal Response which is temporary failure of the brain to maintain blood pressure and heart rate. This can happen due to pain, fear, anxiety, trauma, blood loss, extreme exertion, prolonged static standing, physical or emotion stress, or an unpleasant sight, smell or sound. Some folks like to see the cups on their skin but others get a little weirded out. The good thing is you don’t have to look! What do the dark circles mean? Actually there is no link between the color and the condition of the tissue. More is linked to the porosity and thickening of the tissue as well as appearance of the tissue under the cup (is it creating a nice dome effect or are there divots in the tissue). Cupping should not be used on open cuts/wounds, those with serious heart conditions or vascular conditions, active TB, hemophilia, active cancer, high fever or influenza, convulsions or cramping, elastic skin disorders or over hernias. Caution is used during pregnancy, over certain areas on the face, with healing or thin skin, those on blood thinners, and those with poor tissue healing. Do you still need formal physical therapy? One of the biggest reasons that myofascial decompression works is that it involves neuromuscular re-education. Just like all of our manual therapy techniques, it is not meant to be performed in isolation. It is still very important that you continue your exercises to make lasting improvements in your mobility, strength, stability and movement patterns. If you have a new injury or are someone who needs cuing to improve your movement patterns then a physical therapy evaluation or physical therapy follow up would be recommended. Beth can use MFD during these sessions as indicated. Beth also offers 30 minute MFD appointments. These are appropriate for existing or previous clients with no new injuries. It is recommended that you do your Home Exercise Program after the MFD session.